The Maxant Industries HAND-9F extractor I borrowed is a nine-frame manual extractor. It accepts 6 medium frames radially and 3 mediums or 3 deeps tangentially. The radial is preferred because both sides of the frame spin out at the same time, while the tangential frames only spin one side at a time (then you turn it around). I had managed to gather a meager 11 medium frames to extract, so I spun them radially in two batches. Given I had no idea what I was doing, it was an all day endeavor. In the end I bottled over 40 jars of honey, which I must say is pretty exciting. In addition to the extractor, the club provides an uncapping tank. The extractor is rather bulky as it includes the legs and a wooden stand. The uncapping tank, as it is called, consists of two plastic tubs. 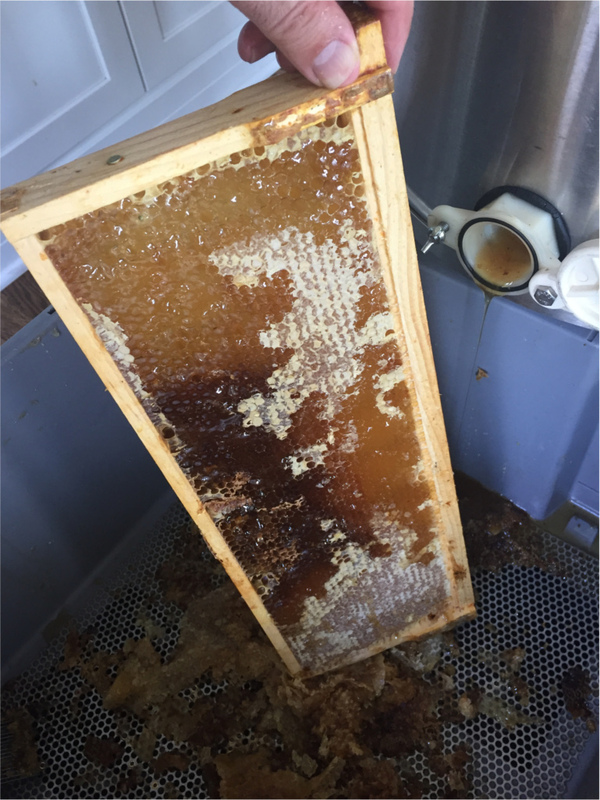 The first has a metal grate that filters out chunks of comb and the wax cappings. The second tub sits underneath and collects the raw honey. The white plastic bucket you see in the picture is mine, and includes a cheese cloth for filtering out finer pieces of wax. 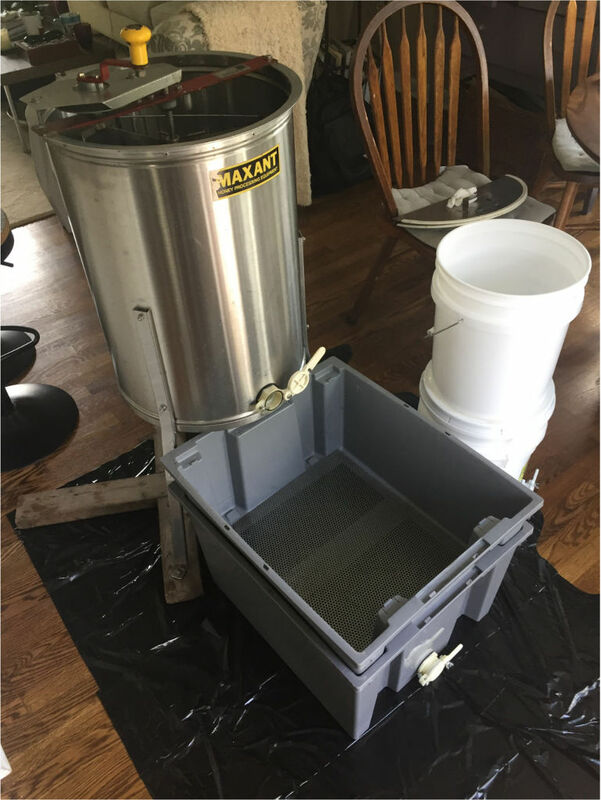 After extracting the honey, I set the uncapping tub on our kitchen counter and drained the honey into my buckets for final filtering, filling the bottom bucket with fresh honey. As another local beekeeper said, there is nothing as good as your own honey. My honey combs are a combination of wired foundation and foundationless frames. Wired foundation has vertical wires through the wax for stability, while foundationless comb are empty frames in which the bees build natural wax comb. Most beekeepers around here advise against both types of frames, preferring to add an additional horizontal wire or two onto wired foundation to provide a more stable frame. I am sure it helps, I just haven’t wanted to do that extra work. In the picture you can see a wired frame after running the hot uncapping knife over it (also provided by the club). This knife is an electric knife that slices off the wax cappings so the honey can drain out; you can see the shiny honey on the frame. I understand why some beekeepers work to make big fat frames of honey, as would be easier to uncap. As you can see the knife missed some spots, and I had to use a cappings scratcher to expose the remaining honey. The actual work to spin out the honey was not terribly difficult. Set the frames in the basket, put the cover on, and turn the crank. Even my darling wife helped spin the frames, and with only 11 frames we were finished after two batches. Then some time to let the honey drain out. I turned off the air conditioner for the day, as hot honey spins and drains easier than cool honey. One of the reasons I wanted the manual extractor rather than the motorized one was based on concerns that my frames might not hold together. This was not a problem. I had one foundationless frame with a bit of comb that was damaged, and I gently pushed it back into place. With the manual crank I could slowly spin the frames up to speed, perhaps a motorized device is harder on the frames. The biggest effort was to clean up the mess. I hooked a hose to the hot water and sprayed everything down outside to remove the honey, then I wiped the equipment down with water mixed with a little bleach. Apparently you shouldn’t use soap as it leaves a residue that can get into the honey. The bleach evaporates away leaving everything freshly cleaned for the next person. The extracted frames I placed on my hives. Eight in a new medium super on my hive Callisto, and three I used to replace foundation frames in Mars. After letting the bucket of honey settle for a few hours, I filled jar after jar with golden liquid. As I said before, best honey I ever tasted. 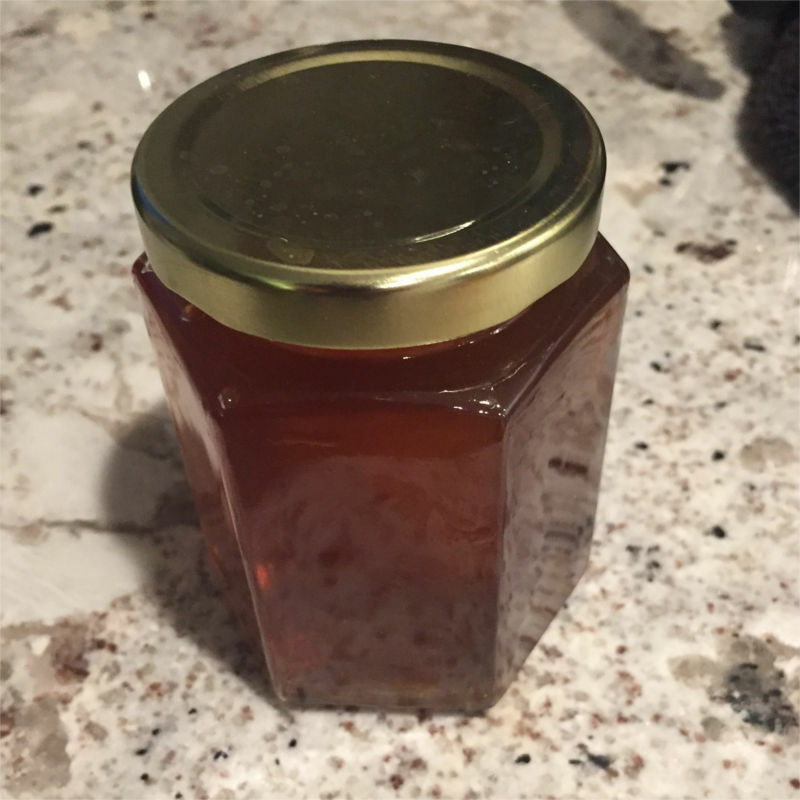 I intentionally tried various honey jars this past year, and decided to purchase glass jars with metal lids, big enough to fit a spoon inside. Plastic lids can crack, and corks can get very sticky, and it is important to have access to a spoonful of honey. 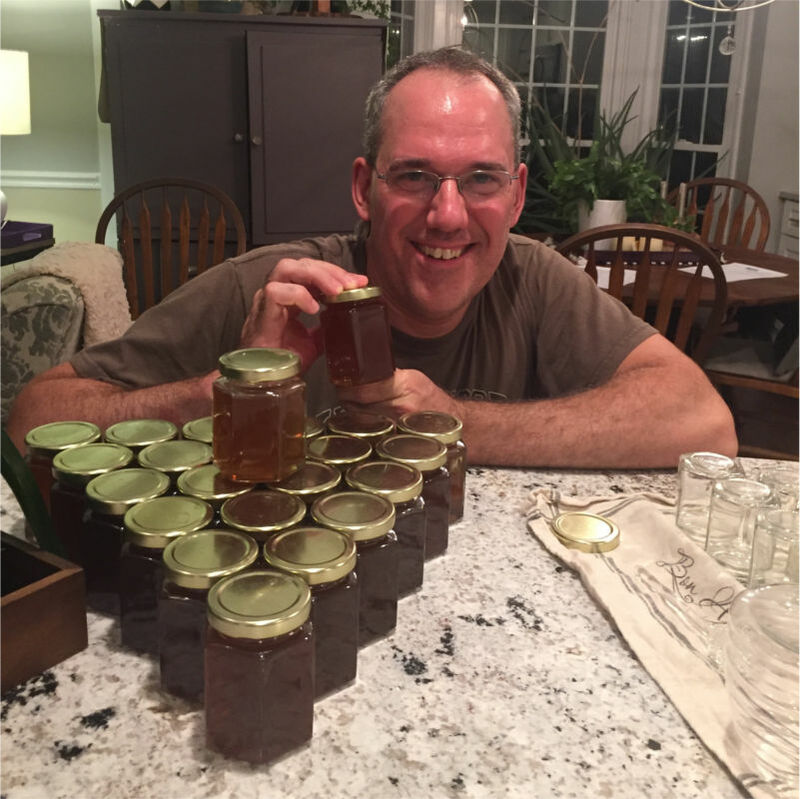 So I had 3 dozen hex shaped glass jars on hand; a dozen that held 6 oz of honey and two dozen that held 9 oz. These were quickly filled. From there it was just finding jars. The honey pot at the top of this post was a birthday gift from my darling wife, various numbers of 8 oz Bell canning jars, a bigger 32 oz canning jar, and finally a random jar I found in the cupboard. My first year I didn’t steal any honey from the bees, and last year (my second) I crushed a single frame to fill five small jars. I rather enjoyed going through the extraction process and filling so many jars, I estimate around 37 pounds of honey total. A meager harvest by some standards, but more than enough for my needs. This rather apt quote by Stefanie Brook Trout comes from the anthology Prairie Gold: An Anthology of the American Heartland. While I have not read the book, I found the quote on goodreads by searching with the keyword ‘honey.” This led me to an excerpt of Trout’s piece from the book that included the quote. It is a nice bit of writing. I wonder if Trout realized the juxtaposition of comparing the loss of natural prairie with the honey bee, which is not native to North America. The quote seems appropriate for a post about extracting and bottling, so I was happy to find it. May you prosper and find honey (I did!). Well done, dear son…….what an awesome pleasure you have accomplished. How proud of you your dear grandfather honey guy would be and in fact, is !! He must be gazing down and smiling !!! The honey you harvest is always the best honey! Great job man! 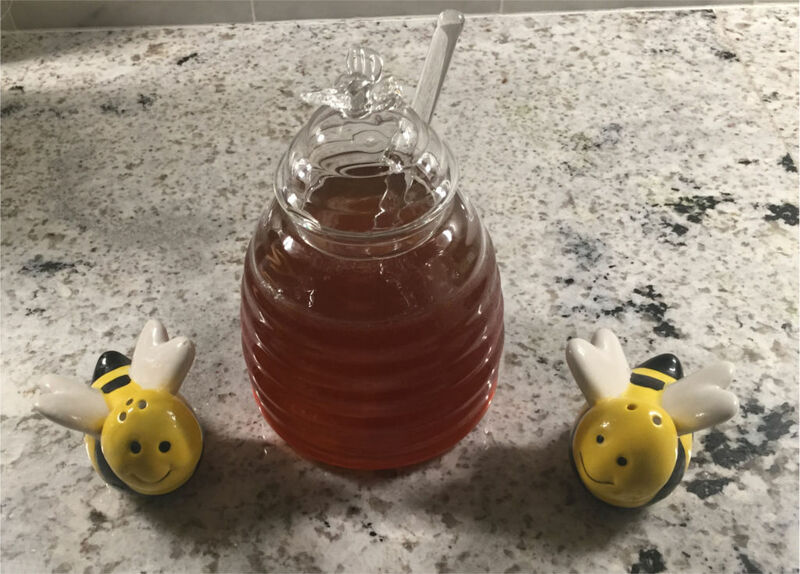 Congratulations on your honey harvest! It looks amazing! It was; it is! Was hoping to harvest some top bar honey as well, but the bees are filling them from the top down, so there are many have capped bars but nothing ready to pull. Haven’t quite figured out how to get the bees to fill one top bar comb at a time yet. Fantastic to see! Looks like a fairly dark honey. You should enter it in some local shows. Thanks, happy just to have for now. I am at the Eastern Apiculture Society conference at the moment so I can at least check out the competition. Hi son…….I love the photo of you with the finished jars of honey. Would love for you to send it alone to dad or me so we could print it out.